So, I’m skimming through one of the hundreds of magazines that I get in my mailbox each month (luckily this is one of the ones I slowly skim through), and what do I run across but a whole issue of Bay Area Business Magazine dedicated to…yep, you guessed it – TOURISM! Now, naturally I was very excited about this so I had to share the great news. We even have one of our employees featured inside the magazine. 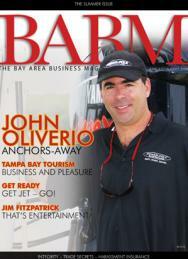 For those of you who like to keep up on the business of tourism in Tampa Bay, I suggest you go get the latest copy of the magazine. And for those of you who don’t keep up, this is a great time to start. From visitor origins to the theme parks, restaurants, events and sports they are participating in when they are here, you’ll get a great glimpse in to the world of the Tampa Bay visitor industry. You can also hit up their website (www.babm.com) and take a look, which will definitely save you some time, and probably money too! Have you seen the topic of tourism anywhere else, or do you have a favorite publication that may be interested in talking about it? Or, have you just seen some crazy topics covered lately? Let us know.